It is with great sadness that the American Meteorological Society announces the passing of AMS President Matthew J. Parker, CCM, who died in his sleep Wednesday night. 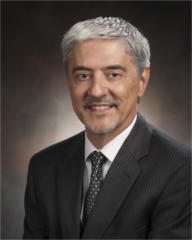 Parker, 53, worked at Savannah River National Laboratory in Aiken, South Carolina since 1989, most recently as Senior Fellow Meteorologist in the Atmospheric Technologies Group. He was elected as AMS President-elect in November 2015, and assumed the role of AMS President during the Society’s Annual Meeting in Seattle this past January. Parker was slated to oversee the Annual Meeting in January 2018 in Austin. Commitment to the AMS community? Spot on, and yet at the same time the phrase only begins to capture the depth of Matt’s passion. His predecessors as AMS president have all served with distinction, and yet each, upon shouldering that mantle for a year, showed signs of feeling the weight of responsibility. By contrast, Matt had charged in, oblivious to any cost of time and effort, any additional workload. He saw only opportunity, and he couldn’t wait to start. Encourage early-career professionals at the annual AMS Summer Colloquium? Matt wanted to do that a year early (and in retrospect, how fortunate that he did). Set the theme for his AMS Annual Meeting at Austin in 2018? Matt didn’t vacillate; he knew he wanted the theme to be communication, and set forth his vision promptly. We’ve known for over a year where he was headed. A tumultuous political season in Washington? Matt had already formulated his roadmap for engagement. We shouldn’t have been surprised. Matt had brought the same larger-than-life vitality to his prior AMS volunteer work, such as his leadership of the Enterprise Commission. Matt brought a unique intersectional perspective to this task, working as he did for a private-sector contractor to a government agency. Early on he embraced the potential for the Weather Enterprise embodied in bringing the public-, private-, and academic-sectors of our community into close collaboration. He worked tirelessly for years to help bring that about. We’re better positioned than ever to serve the American public thanks to his efforts. It is given to each of us the privilege of seeing at most a sliver of another’s life, no matter how close our relationship. As members of the AMS community, most of us lack direct experience of Matt the family man, Matt the church leader, Matt the citizen. But we can extrapolate from what we see… and to do that is to realize we are not the only ones to feel his loss. Our sympathies go out to Matt’s other communities. But we can also offer this special insight – and comfort – from meteorology. We know that the weather and the world’s seven billion people are akin, in this respect – they are chaotic systems. The meteorologist Edward Lorenz discovered that the smallest influences, the least details in the atmosphere don’t dissipate. Their impact expands, changing the atmosphere’s destiny to an ever-increasing extent with the passage of time. So it is with our lives. Our influence doesn’t wane on the day of our physical death. It too continues to grow. Matt’s influence on each of us has changed our subsequent engagement with each other, as well as with others outside our immediate meteorological circle. Those small effects in turn have touched even larger circles of friends and acquaintances. Matt’s influence has thus been expanding for years and will continue to do so. The ministry of Jesus (quoted here) and the coming Easter season reinforce this same idea. Though initially confined to a few square miles of middle East real estate, and lasting only three years, his influence now extends worldwide, and even continues to grow, 2000 years later. Matt, we all miss you for now, but we’re soldiering on, and we’re told our eternal destiny is to be together again. Back in 2005, or so, Mary Glackin and Matt Parker suggested I become involved in an effort to establish an AMS committee that engaged the private sector, academe and government, whose charge was to explore improved interactions among the sectors. In those days, encounters between government and private sector AMS members were sometimes less than mutually trusting, or even civil. Shortly thereafter, a probationary committee, the ad hoc Committee on Climate Services, was born (2006). Members of the committee were approximately equally divided between the three above sectors. Over the next several years, through more or less regular on-line meetings, and face-t0-face discussions at AMS meetings, starting with members of the committee, and eventually spreading more and more to membership at large, the originally-sought improved interactions seemed to be actually happening, proving once again, that its better to talk to each other than about each other. The committee was given full status in 20o8. Whether and how much this rapport may be credited to the CCS itself is impossible to measure. What I do know is that, on at least two occasions I offered to Matt that I might not be the right person to lead such an effort. Matt always responded, with the calm, but not patronizing, confidence that was his signature, that he thought I was, and that things were probably going better than I might think. He was right, of course, and I will be forever grateful to Matt for his confidence in the efforts of our committee. Thanks for this comment, Ed… and thanks especially for your leadership role with that committee. I had a ringside seat for some of that work, and it was a privilege to see you in action. Thank you Bill! I’ve only known Matt for the last two years or so, but he was very accessible and easy to talk to. Many people can be intimidating to visit with for the first time, but he wasn’t at all. He was proud of my Spengler Award that was awarded when he was the commission chair for CWWCE, and that was what our first conversation was about when we got formally introduced. This year at AMS, I was really looking forward to helping champion his theme of communication for the next annual meeting, and serving on the council with him. We had a great visit on climate and energy as well after the CWWCE, discussing a workshop he was working on later this year. I see all the posts and tweets about things he did to make people feel welcome, encouraging them and mentorship. We’ve lost a bright light, and I hope the rest of us continue to shine in his honor. Wonderful LOTRW and tribute to Matt. All who know Matt, in many cases for many years, feel this sudden personal loss but also a loss to science, communication within and to those outside our science and to the AMS. Matt had a gentle, steady strength and spirit to serve science, society and our Society. He indeed was a true champion of inclusiveness, a spirited, dynamic leader for one of the core sectors of our science and the AMS. I’m certain his vision for AMS Austin 2018 will be realized and look forward to celebrating a life well, if much too short, lived at AMS 2018. I have known Matt Parker since the early 1990’s and have spent many hours with him attending meetings, dinner, football games and of course collaborating on science and our profession. What always amazed me about Matt was his passion for our profession, his energy whenever he tackled a new assignment and his total commitment to excellence. Matt was an optimist and his optimism was infectious. I remember Matt and I traveling to Asheville to attend our first NCIM meeting in the early 1990’s. I think we both were two of the younger attendees. Halfway through the meeting Matt turns to me and says they need new blood so we are going to donate. That was Matt. Always volunteering his time or diving head first into a new professional commitment. Matt inspired me many times over the nearly three decades I have known him. He was instrumental in me obtaining my CCM which without Matt, I may have never went through the process. In the last couple of months I have been collaborating with Matt on a project in the area of solar forecasting . I always get into the office very early so when my office phone would ring at 7 am usually it would be Matt. Matt’s passing is a loss for our AMS community but it is a personal loss for me of a closet friend. Thanks, Nick, for this eloquent perspective. Love the NCIM story. That’s Matt! Matt Parker made service to others a priority from which we as AMS members and the world generally are beneficiaries. I join with others to pause and reflect on his leadership. Like a wheel with a missing spoke, we miss you, Matt. Matt was a unique individual of immense personal and professional integrity. He was always looking for common ground and quick to facilitate a compromise in the most difficult and protracted of disagreements and ideological conflicts. Diplomacy and statesmanship of this caliber are in such short supply in these chaotic times. Matt’s untimely passing robs us of the very many things he was yet to accomplish. Thanks for these thoughtful words, Tom. First… Amen Bill!!! I met Matt less than a year ago at the 2016 AMS Summer Policy Colloquium, but it seems like I have been knowing him for years as a brother. This is because Matt had a special ability of engaging people and building relationships quickly. After 23 years in a weather career, I became a national member of AMS and attended my first annual meeting this year largely because of Matt’s influence. Over one of the dinners at the Policy Colloquium, Matt asked me if I was an AMS member? In which I told him, no, not at a national level but I did participate locally. Matt moved in fast to encourage me about not only joining AMS at the national level, but to get actively involved in the organization. Matt really understood the strength of developing a diverse team, and he made a special effort to reach out to minorities to make sure they felt included in the AMS. I saw this evidence, as I saw his active engagement and attendance in the Board of Women and Minority meeting at this year’s annual meeting. We also see this in his passionate and persistent effort to bring the Broadcaster’s Meeting back to the annual meeting. I know many of us will miss him, but the passion inside of him that he had a knack for passing on to others will live inside us forever. I knew Matt from the hobby of beer can and breweriana collecting. He exhibited all the traits detailed above. He was always a gentleman and very even-keeled. He and his wife Shawntel were a fabulous team. He has had a positive effect on my life. I didn’t know Matt, only met him through the AMS at this year’s meeting in Seattle. My heart aches for his family. I lost my mom last year, and she was in her 50s too and it is way too young to be taken from this life. I can empathize with how devastating it must be for his family and friends, and they are very much in my thoughts. A true mentor, colleague, and friend – Matt will be missed tremendously. Tough to get out an operational energy-industry forecast without thinking of Matthew since I heard the news. The skies are crying here in California. Matt made voluntary work at AMS quite meaningful and fun to me personally and many others that served on a committee I chaired. Indeed, it was Matt who convinced me that I should take on the chair role for 3 additional years at a time when I was ready to move on after serving 3 prior years as a working group chair on the same committee. As if passion to serve the AMS community is not a great trait in itself, which Matt always exhibited, he was a fantastic individual, considered by many as a true friend.